For 15 years now, the Oeschger Centre summer school has been attracting both young researchers and experienced scientists to Grindelwald. In a relaxed atmosphere far from the ivory towers of academia, young scientists from around the world can network with their peers and engage with their role models. There couldn’t be a better venue for a summer school session on climatology. The windows of Grindelwald’s convention centre look out onto the lower Grindelwald glacier – or what’s left of it, anyway. Since the 1970s, the proud glacier – which once stretched into the valley – has shrunk by more than three kilometres. From August 28 to September 2, 2016, this symbol served as a constant reminder of the impact of climate change to the 70 PhD and postdoctoral students invited here by the Oeschger Centre for Climate Change Research at the University of Bern. And it gave them something to think about. And as Monica Ortiz, who’s doing her dissertation at Britain’s University of Sheffield, explained, “In my country, the Philippines, we suffer from completely different consequences of climate change; tropical cyclones are on the rise.” In Grindelwald she realised that climate change is a common problem, and learned more about how people deal with the increase in natural hazards in other parts of the world. The two young researchers had two reasons for taking advantage of the academic opportunity in the Bernese Oberland: the theme (“Climate Risks – Coping with Uncertainty”) and the setting at the foot of the mountains Eiger, Mönch and Jungfrau. “I’ve never been to a conference at such a terrific location,” said Sarah Schlunegger, a specialist for marine bio­geo­chemistry. And the biologist studying the influence of climate change on crops in Europe wants to learn, for example, “how to communicate with politicians about risks and uncertainties”. Organised by the Oeschger Centre, the Swiss Climate Summer School took place again in Grindelwald this year – as has typically been the case over the past 15 years. Besides the venue, what has also remained the same over all these years is the interest of young climatologists from around the world. The participants – roughly an equal number of women and men – are selected carefully, with only about one in four applicants getting in. About half of the young researchers come from abroad; this year’s group represented 13 nations, including Australia, Britain, China, Iceland, Germany and the US. 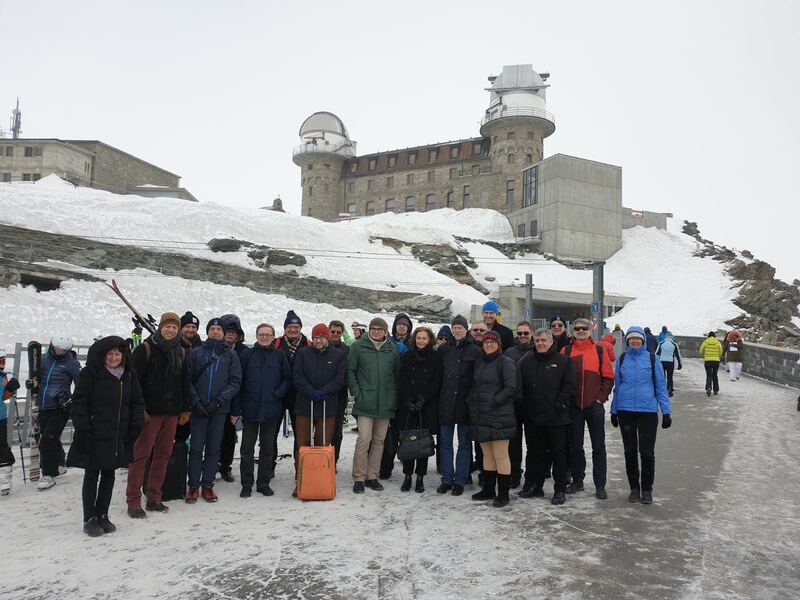 The international thrust of the summer school has been key from the beginning, as the event is something of a flagship for Swiss climate research and also the University of Bern. The lecturers – all renowned researchers with an impressive list of publications – appreciate the international atmosphere. For example, science historian Naomi Oreskes of Harvard University has made a name for herself with “Merchants of Doubt” – her analysis of climate sceptics. Why does she come to Grindelwald regularly to spend a whole week with young scientists? Awakening intellectual curiosity is a key goal of the program in Grindelwald. “We don’t just talk about interdisciplinarity,” grinned Oeschger Centre Director Martin Grosjean, “we live it”. The five University of Bern professors who spoke at this year’s summer school come from three different faculties and teach physics, geo­graphy, political science, philosophy and economics. The interdisciplinary approach works well in Grindelwald, says Martin Grosjean, because the speakers know how heterogeneous the audience is. So they’re careful not to speak just for specialists. Besides all this new knowledge, the up-and-coming researchers in Grindelwald benefit not least from the net­working and the easy access to the established researchers. Professors whose names they might only have known from publications suddenly have time for discussions if the students are brave enough to approach them. Sarah Schlunegger, who’s in the first year of her doctoral dissertation at Princeton, didn’t hesitate when she saw a lecturer sitting alone at dinner.